You wouldn’t believe how hard it was to illustrate the Alice in Wonder Land Tea set, due to the fact the tea cup is white, I should of put something colourful in the background!! I’m such a stickler for perfection!! Talking of perfection i just love the perfect delicate detail on this mug, all around the saucer edge and the rim of the tea cup are these beautiful delicate little drawings of, cats, mice, chess pieces, hearts and tea pots just to name a few. It is so freaking cute! When I infused my Strawberry and kiwi fruit tea the colour contrast was just beautiful! You can tell I am a massive Tea Geek, chatting about colour contrast! The fruit Tea itself was a little different to the flavors I had tried before it has a sort of kick of kiwi at the end which is really refreshing. I was obsessed with Fruit teas whilst at was at uni, i think its because I lived with a load of vegans and vegetarians..yes they got me hocked total peer pressure…that I missed sipping beautiful tasting and smelling teas! I thought the strawberry part was rather English sounded and worked well with the Alice in Wonder Land theme. So after the wonderful success of my last Whittards Tea Tuesday Give Away, we are back for more!! 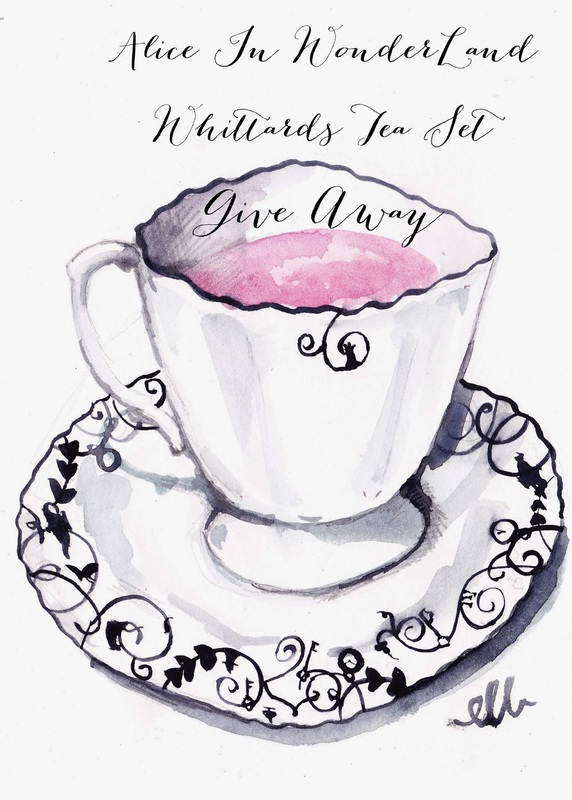 you have the chance of winning the Alice in Wonder Land Tea set, the lovely people over at Whittards are give ella readers the opportunity to win yourself a set of Alice and wonderland goodness plus a pack of strawberry and kiwi fruit tastiness! Only one winner can be announced. 4. Comment – Leave a blog comment stating what you love about tea especially in the summer!? I loved iced tea. When we were road-tripping around the American south it was so amazing to stop at gas stations and fill up one of those crazy enormous cups full of iced tea and then carry on. (Although we had to mix the sweet and unsweet because the sweet was like teeth-rottingly sweet!). I love that it's their staple drink of choice there, alongside homemade lemonade. We always try and recreate it in the Summer and try and have a jug in our fridge full of iced tea, we made one using rhubarb flavoured redbush once which was delicious! you know what – someone once told me that when it's boiling hot outside, if you drink hot tea, it will cool you down!? it's obviously more of a psychological thing, but it tends to work for me in the summer! Love lemon tea in the summer – so refreshing! I love tea and always make it in a pot and drink it from a china cup and saucer. I hate the thought of just dunking a tea bag in a mug! Tea tastes so much nicer served properly! Thank you for the lovely giveaway! Relaxing, ideal for time out with friends. It's not a love, it's a life source. I can't live without regular topups. I love the fact that tea in the summer can actually cool you down! I love this illustration. The tea sounds delicious too! I have just discovered earl grey …..I know where have I been – bit I love t! There is nothing better than sitting down to a pot of tea and something sweet. To say I love tea is an understatement! I love cups of tea – morning afternoon and night! I love tea, it is my addiction, theres nothing better in any situation ! I really like fruit teas, I think they are great for summer because once you've brewed it you can drink it hot or cold. I like making iced tea too! You also can't beat drinking a nice cup of tea outside in the sun, either sitting in the garden, having tea from a flask on the beach, or even at a picnic! I love a big mug of tea on an evening after work snuggled on the sofa, it's relaxing, soothing and comforting, nothing beats it! What a gorgeous prize! Love tea but not tried strawberry and kiwi, it would be perfect for the summer! There's nothing in the life that a good cuppa can't make (even slightly) better. I love how, when all else fails, us Brits always stick the kettle on. Can't beat it! If I'm lucky I get to have one cup of hot tea a day. Most of the time it gets cold as I am looking after two children under 5. Can you drink too much?? I drink it constantly! Love IT!!! Your illustration is very cute! I am myself huge tea fan, but some English purisst friends of mine said that flavoured tea are not tea and I strongly disagree. But being french, my opinion wouldn't count so much 😛 But hey the hell with the purist I just drank a lovely caramel tea! Love my tea, its got to be made in a teapot and drunk from a bone china mug. My children have left home now, but I gave each of them a little teapot and mug so I can enjoy tea at their houses. Have I gone too far? I have tea every day. I am a massive tea fan, can't live without it! Tea is the best drink all year round but in the summer, I particularly love fruity teas because they're refreshing, light and make me feel healthy whether it's hot or iced tea! Yummy. My favourite thing about tea, especially in the summer; is sitting out in our garden with a pot of tea and my mum, in the sunshine. I love those times. I love a good strong cup of English Breakfast tea in the winter but occasionally I will try a few flavoured teas in the Spring/Summer. The tea cup and saucer looks so adorable! Hate coffee but love tea! at work…i drink about 8-9 cups a day its insane!! I drink about 5 cups a day used to drink more but now im trying to cut down lol. I'm a real Earl Grey fan – normal in the morning, decaf in the afternoon. milk & one sugar – perfection! I love a cuppa tea as it reminds me of going to my grans! I remember her tea cosy well…..always reminded me of the ones you put over loo rolls! I LOVE the whole tea-making thing! You know, the playful splash of the tea as it hits the bottom of the cup; the thrill of adding the milk, and watching it settle for a moment, before it filters slowly down through the cup, changing the colour from dark brown to…a lighter brown. Perching an optional biscuit on the saucer, like a proud soldier standing to attention beside a giant…cup of tea. Tea keeps you alive. I have to have at least 5 cups a day. I love a cup of tea in the evening with a bar of chocolate once the kids are in bed. It's part of my routine now. I'm not a fan of your bog standard tea with milk and sugar but I love nothing more than a nice, refreshing floral tea in the Summer time. what is life without tea? it gets me through the day! I love tea and I now use loose tea for a better flavour. I can't go a whole day without a cup of tea! And I'm obsessed with Alice in Wonderland! i love tea, but it always makes me hungry!! I live on tea – I normally drink 'normal tea', medium strength, no sugar, drop of milk. I drink it from getting up to going to bed – around 15 cups a day :/ I also drink a lot of pomegranate green tea and peppermint tea, although At Christmas though, I love Whittards Mulled Wine tea, it's amazing! I love tea and it keeps me going throughout each day. I always think it tastes best after a walk out in the cold. Tea is my favourite drink, I could not live without it… It helps me to wake up in the morning, and I drink it through the day and evening. My mum used to give it to me warm and milky in my bottle when I was a toddler and I have loved it ever since (to the point where I still have it relatively milky now) and I love having a fresh brew from tea leaves in a quaint cafe with a slice of cake! I really do believe that a cup of tea makes everything better, it's good for the soul. Oh my gosh I love tea. So much that I have recently had to switch to decaf tea as I had terrible insomnia. It's all I drink! I like to try different flavors so tea doesn't get boring. Nothing beats curling up on the sofa with a nice cup of tea!